Residents of the 108th District who are interested in pre-verifying their documents for REAL ID are invited to attend a REAL ID Pop-Up Verification Event. See information below. Customers must bring the required REAL ID documentation to the event and PennDOT staff will scan the documents to the customer’s driver record and mark it as “REAL ID Eligible.” Then, when REAL IDs are available in March 2019, these customers can apply for their REAL ID online, pay the applicable fees, and it will be mailed to them directly within 10 business days. No. REAL ID is optional for Pennsylvania residents. You will be able to get either a REAL ID driver's license or identification card, or a standard driver's license or identification card. If you have a valid U.S. Passport or U.S. Passport Card, military ID, or another federally approved identification, you may use this as your form of identification to pass a TSA checkpoint at airports nationwide and visit a secure federal building or military installations at any time. PennDOT’s REAL ID online wizard may help you decide if and when to get a REAL ID. If you know you will not be boarding a commercial flight or visiting a secure federal facility or military base after Oct. 1, 2020, or if you have a valid passport, you do not need a REAL ID. Proof of identity: Birth certificate with a raised/embossed seal issued by the department of vital records or valid U.S. Passport or Passport Card. Social Security card: The name on your card must match the name on your proof of identity document. Two proofs of current, physical PA address: Common examples include current, unexpired PA license or ID, vehicle registration, or utility bill. Proof of all legal name changes: Common examples include certified marriage certificate(s) or divorce decrees(s) issued by the county in which you were married, or court order(s) issued by your county’s family court. Please note: you must show a complete name change history that links your birth certificate name to your current name. If you have a valid U.S. Passport or Passport Card with your legal name, you may use that as your name change document. Use this document checklist to make sure you have all the documents you’ll need to get a REAL ID. A representative from the Bucknell University Small Business Development Center (SBDC) will be available by appointment at our Sunbury district office located at 106 Arch St., between 10:00 am and 3:00 pm during a special Small Business Outreach Day on Friday, Feb. 15. Current or aspiring small business owners are invited to schedule a time to meet with a SBDC Business Consultant for advice and guidance on starting and/or growing a small business. Are you interested in how hemp is transforming Pennsylvania agriculture? Learn more about this innovative industry from Senior Lab Technician Tara Caton from the Rodale Institute, and enjoy breakfast served by members of the Christ Community United Methodist Church. This year’s breakfast will be held Friday, Feb. 22, at 9 a.m. at the church located at 3939 Park Road in Selinsgrove. Those involved in the agriculture industry throughout the 108th District are invited to attend, and we look forward to seeing you! This event is being sponsored by Susquehanna Community Bank. Please call my office at (570) 286-5885 or 1-(800) 924-9060 to RSVP before Feb. 15. 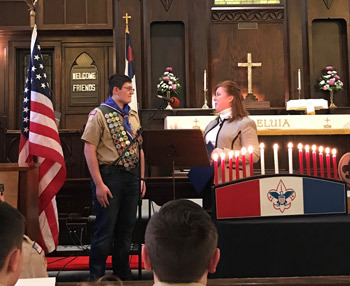 Congratulations to New Eagle Scout Jacob Mowrey! 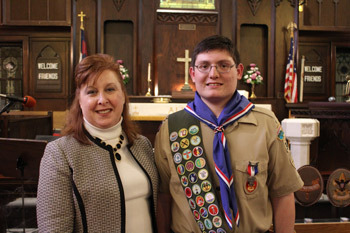 This week I attended a special ceremony for local Boy Scout Jacob Mowrey. 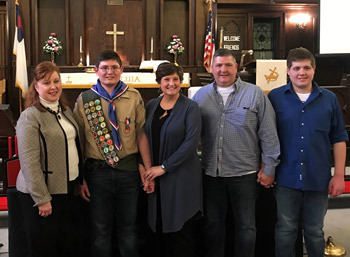 I was thrilled to attend Jacob’s court of honor ceremony and present him with an official citation from the Pennsylvania House of Representatives for attaining the rank of Eagle Scout, which is the highest achievement that can be reached by a Boy Scout. For Jacob’s project to fulfill the community service requirement, he helped convert a basement storage space into a woodshop area for The Refuge. The Refuge is a local nonprofit organization in Sunbury that operates an after-school program for teenagers that offers homework assistance and life skills activities. Congratulations to The Arc of Susquehanna Valley on the grand opening of their new building, located at 326 Market Street in Sunbury. 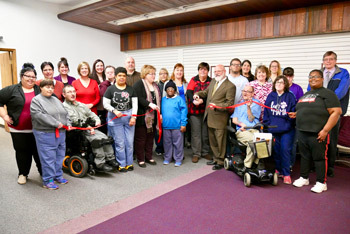 I attended the ribbon cutting for the new facility where day and evening classes and social programs for individuals with developmental and intellectual differences will be offered. To learn more about these programs visit their website. The 2019-20 session will seat the largest class of women in PA House history! 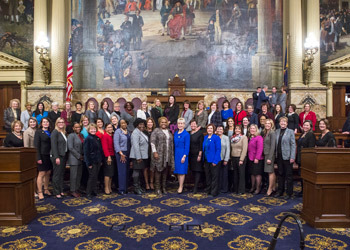 I am incredibly proud to be one of the fifty-one women representatives serving Pennsylvanians. Since 1922, there have been 178 women who have served our Commonwealth in the House, including 81 Democrats and 95 Republicans. Pictured here on the House floor is the largest class of women representatives. Photo taken 1/16/2019.